Use of cloud computing services continues to grow rapidly as organizations migrate business applications and data to cloud-based software, platform and infrastructure services. Gartner estimates 2017 will see growth of 18% in spending on public cloud services and that cloud adoption will infuence more than 50% of IT spending through 2020. Deloitte Global predicts that by the end of 2022 more than half of all IT spending will go to IT-as-a-service providers. 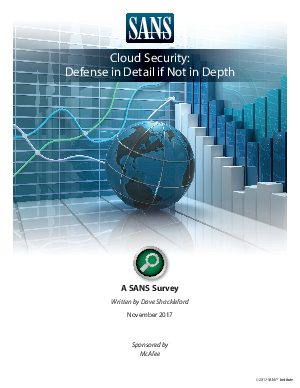 In the 2016 edition of this survey, 56% of the security professionals responding said limitations on access to collect incident response data and evidence for forensic analysis was a key challenge to securing the cloud. Sixty-two percent said they were concerned about unauthorized access by outsiders, and 59% said they worried about access by other cloud tenants. Of the 10% who reported being breached, half blamed stolen credentials or compromised accounts.